1.1. This website (the "Site") is operated by Collinson Latitude on behalf of Virgin Atlantic Airways Limited ("VAA"/"we"/"us"). By accessing or using the Site you agree to be bound by these terms and conditions as amended or updated by us from time to time. 2.1. When you purchase goods and/or services through a third party retailer advertised on this Site you will be entitled to earn Flying Club miles, as long as you have logged into your Flying Club account on virginatlantic.com/flyingclub. 2.2. 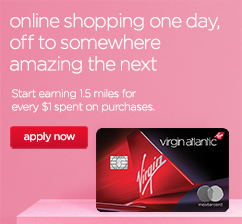 When you purchase goods and/or services through a third party retailer advertised on this Site you will be entitled to earn Flying Club miles, as long as you have logged into your Flying Club account on www.virginatlantic.com/flyingclub. 2.4. Flying Club miles will not be awarded on the purchase and/or the use of gift vouchers, which for avoidance of doubt includes gift cards, gift certificates or any other similar cash equivalents, or on taxes and/or delivery charges. 2.5. Flying Club Miles will only be awarded on purchases made with retailers featured on the High Street Offers shopping pages of the Site after you have registered valid payment card(s) and made qualifying purchases with the registered payment card(s) at the participating merchant (in line with the specific offer Terms & Conditions which will be displayed on the High Street Offers shopping page. 2.6. It takes up to 24 hours for each payment card to be fully registered for Flying Club Miles awarding with qualifying High Street Offers retailers. 2.7. No Flying Club Miles will be awarded for purchases made using payment card(s) that were first registered on the Website less than 24 hours prior to the time of the purchase. 2.8. No Flying Club Miles will be awarded for purchases made using Apple Pay, Android Pay, Samsung Pay, Wallet providers including PayPal and YoYo Wallet, Retailer store cards and cards not bearing the Amex, Visa or MasterCard/Maestro symbols. 2.9. We reserve the right to change or withdraw retailers and offers featured on the High Street Offers pages at any time. 2.10. If you register payment card(s) that have previously been registered on the Site with another Website for a similar purpose, this may exclude the same card collecting Flying Club Miles, irrespective of whether or not the retailers appear on another Website. 2.11. If we believe that any form of Misconduct has occurred we may not award or may remove any Flying Club miles from your account. 2.12. We reserve the right to cancel any Flying Club miles awarded to you in respect of a purchase which you subsequently cancel (i.e. if you didn't pay for or later returned the goods and/or services for which the miles were awarded). 2.13. Any claim for missing Flying Club miles must be made to us in writing within 90 days of your purchase. All claims are resolved by us at our sole discretion. 2.14. No tier points will be earned for any purchases made via Online Shopping. 2.15. Flying Club kids accounts and 004 Flying Co accounts may not earn miles. 2.16. UK Flying Club members earn miles on every GBP pound spent and US Flying Club members earn miles on every USD spent. Purchases need to be made in local currencies of the retailer or member location?. 2.17. In order to earn miles the shopping transaction needs to be in the name of the Flying Club member. 4.1. The Site contains references and/or links to the websites of third party retailers and/or advertisers. We have no control over and are not responsible for the content of any third party websites, nor for the goods, services and/or information supplied through them, or for any charges you incur as a result of your dealings with any third party. 4.3. In no event whatsoever shall VAA be liable, either directly or indirectly, for any loss or damage howsoever arising for personal injury, death, property, nor for pecuniary loss or damage arising out of your use of such goods, services or information offered by a third party. 6.3. We reserve our right to withdraw, cancel or vary at any time without notice to you any service or benefit provided or offered to you as a Flying Club member and in no event will we be liable for any loss or damage, howsoever arising, suffered by you as a result of our withdrawal, cancellation of variation. 6.13. Virgin Atlantic retains sole discretion to close any Flying Club account as per the Flying Club Terms and Conditions if we suspect dishonest or suspicious behaviour. 6.14. If coupon/voucher codes that are not listed on our Shops Away website are used, the transaction will be invalidated from earning miles. Promotional rates will no longer apply from the beginning of any statement period during which you have breached your terms and conditions, for example if you haven't paid on time or have gone over your credit limit. You cannot transfer balances between MBNA accounts. Virgin Atlantic Airways Limited is an introducer appointed representative of Virgin Money Personal Financial Service Limited, Registered Office: Jubilee House, Gosforth, Newcastle upon Tyne, NE3 4PL. Registered in England and Wales number 3072766.